Who likes to be comfortable on Thanksgiving? This girl. And probably you too. My family (and Dave’s family too) aren’t the type to host fancy get-togethers. The food is just as good when you’re wearing glorified sweat pants as it is when you’re all gussied up, which is why my preference is comfortable outfits for every holiday. Now, with that said, it doesn’t mean that I dress dumpy or lazily. I still use holidays as an excuse to get a new sweater, piece of jewelry, or rock a shoe that I don’t wear every day. Last year I wore a mix of casual and fun with a pop of bling. This year, I’m not 100% sure which of these three outfits I’m going to wear, but all are equally good options. Let me know down below which you think I should wear, and what you’ll be wearing to celebrate Turkey Day! 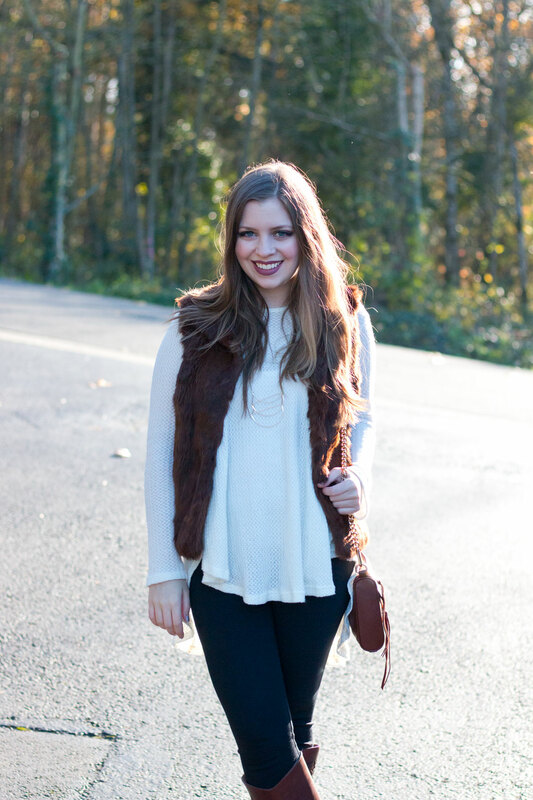 Did you really think I was going to post an outfit without my favorite vintage fur vest? This is probably my favorite investment of all time and it always brings on the compliments and questions at gatherings! It makes a statement, and while I don’t condone purchasing new fur, I don’t have a problem with the vintage variety found at consignment and thrift stores. 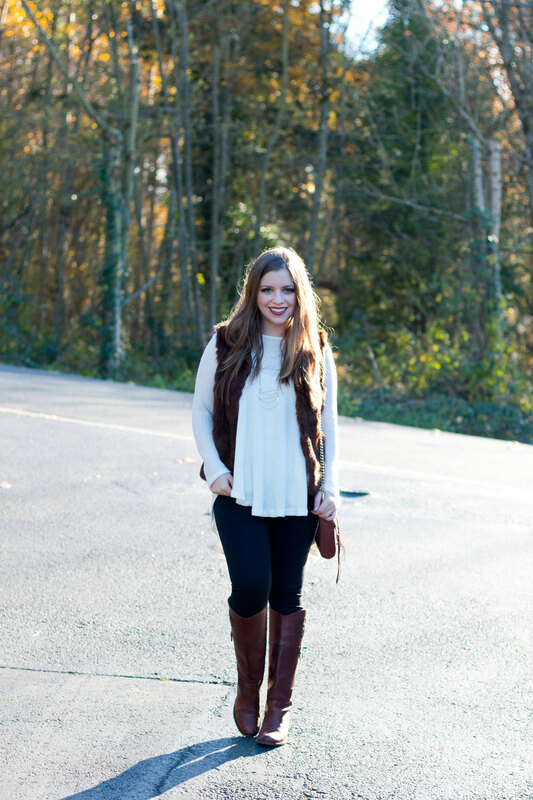 What I like about this vest is the ability for it to add interest to an otherwise boring outfit. I picked up this tunic in California at Purre Boutique, and it’s the perfect vehicle for cozy blanket scarves, fur vests, and statement coats. These leggings are from Wolford and honestly remind me more of Ponte Pants than leggings. Plus, unlike most leggings, they hold their shape. They are pricey, but I believe the price is directly related to the high quality this material. I could see these lasting for years, unlike their cheaper competitors that I throw away after a few wears. I picked up this poncho a few months ago when the ladies from Emerald Cuff had an open house sale. I fell in love with it and knew it would be perfect for the plane rides we had in October and November. (I’m perpetually freezing on planes, and it’s basically like a giant sweater blanket!) It would also be the perfect thing to wear to a holiday party. It looks beyond chic but hides food babies! Win-win. I’ve again paired this with the ultra comfortable Holly Leggings and these new over the knee boots I ordered this month from ShoeDazzle. I’d been seeing the Stuart Weitzman Lowland Boot everywhere, and while I love the look, I can’t fathom $800 for a pair of boots I wasn’t 100% sure I’d love. I do still want them, but will probably be waiting for a mega sale. Now to be fair, these ShoeDazzle boots are nice, but not high quality. I find that I have to tie them up very, very tightly, so they stay up. I had a similar problem with my last pair of over the knee boots from JustFab, which had no ties and never stayed up after the first wear. From what I’ve gathered in searching how to fix this issue, this is pretty typical with boots that aren’t very well made. So, if you’re on the fence about the OTK boot trend, these might be good to test the waters (I only paid about $30). If, however, you’re sure the look is for you, I’d recommend trying out the Dolce Vita Neeley (flat) or the Steve Madden Gorgeous (heel) which score high praise in reviews. Alright, it’s the final outfit! This is all about the grays. What can I say, I like a good gray outfit. Well, with a pop of color of course. I chose my absolute favorite ankle booties for this look, and my coordinating bag from DailyLook. I had been eyeing this fringe sweater from JustFab in the monthly collections, and finally pulled the trigger this month. I do love it, however, the quality is a bit disappointing. The fabric is quite itchy, even though the wool content is rather low. Additionally, the fringey bits are unfinished and do seem to catch on things which mean threads threads everywhere. It does pair well with my J Crew Factory City Coat and my Holly Leggings. I love how I can roll these leggings up like I would jeggings or skinny jeans and get the same look! Now, which outfit do you think I should wear? I’d love to hear your thoughts and what you’ll be wearing to stuff your face in the comments! Happy Thanksgiving! THE PONCHO! 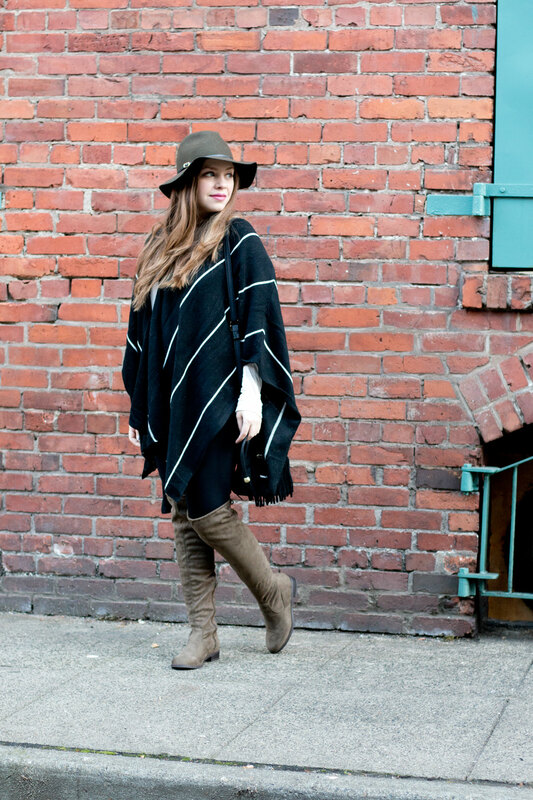 ALL THE HEART EYES FOR THE PONCHO!! I like your first outfit the best out of these. I’m pretty sure I’m wearing leggings, a long top, and maybe a blanket scarf. But for the most part I’ll lose the scarf and be wearing an apron instead. I can’t wait to NOT host Thanksgiving next year! That’s what I went with, and yours sounds like the perfect outfit! And yay for not hosting next year! We usually host Christmas brunch and it’s total mayhem. I don’t think you can go wrong with any of these – I love them all! I think my favorites are one and three :) I hope you have a wonderful Thanksgiving, and I can’t wait to see you soon! I love all the looks! I am obsessed with the lip color in that first look, and I love that your fur vest is vintage! Mine is from Target last year…hahaha, super cool. i can’t believe how much that one bag looks like the chloe bag! it’s pretty spot on there. I like the fur vest one the best, although they are all very cute. I am having a small dinner at home with just the hub and kid but then probably venturing out for drinks so I’m thinking leggings, high heeled boots, a tunic sweater and either my army or faux-fur vest. You inspired me! Go with the first outfit! Funny, I’ve been searching Pinterest for Thanksgiving outfit inspirations this morning! Love all of these looks; I think number 3 is my favorite! ooh, I love look #2! love these outfits, especially the last one! i’m all about the greys lol. my husband’s family are not fancy at all and most of them literally wear sweats or pjs, so i try not to go too crazy.. but leggings and a chunky (grey!) sweater are my go to.